It's a slim paperback and forgotten by most. 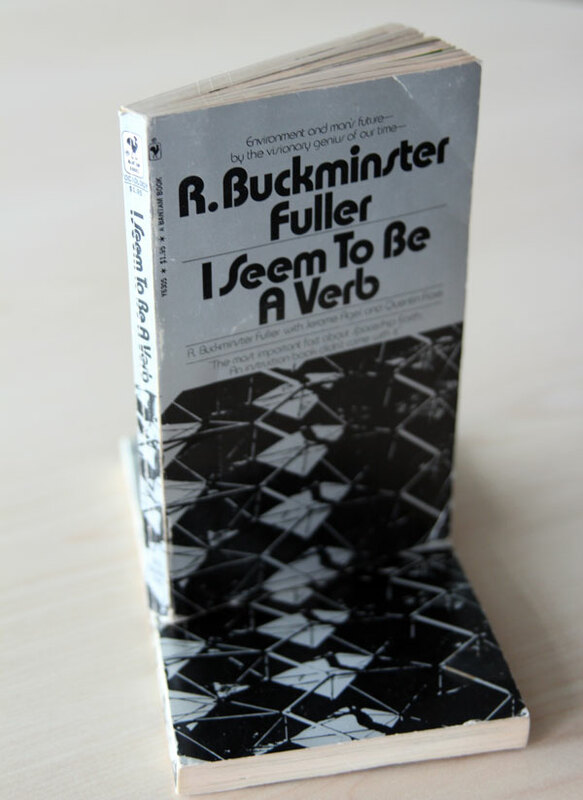 But I Seem to be a Verb by R. Buckminster Fuller is a cult book for many reasons, not least because its content appears to resemble what the modern Internet has become. The quotes, the slogans, powerful images packed with meaning, facts designed to influence a reader in a split second, and political sound-bites - they are all there. This book contains elements we consume on a daily basis via Facebook, Tumblr, Reddit and Twitter, and yet it was written while Richard Nixon was in the White House. 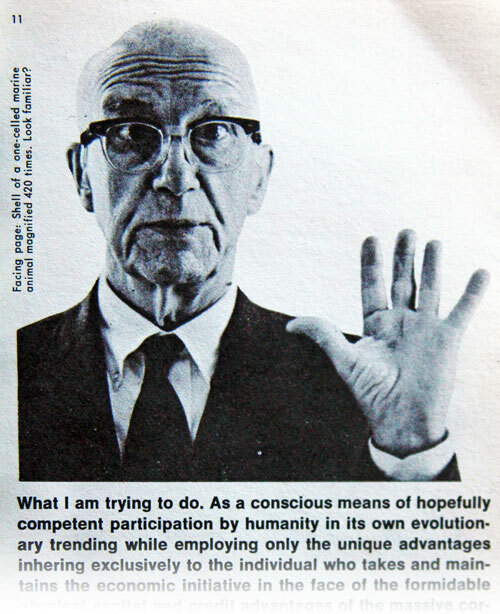 Firstly, who was R. Buckminster Fuller? 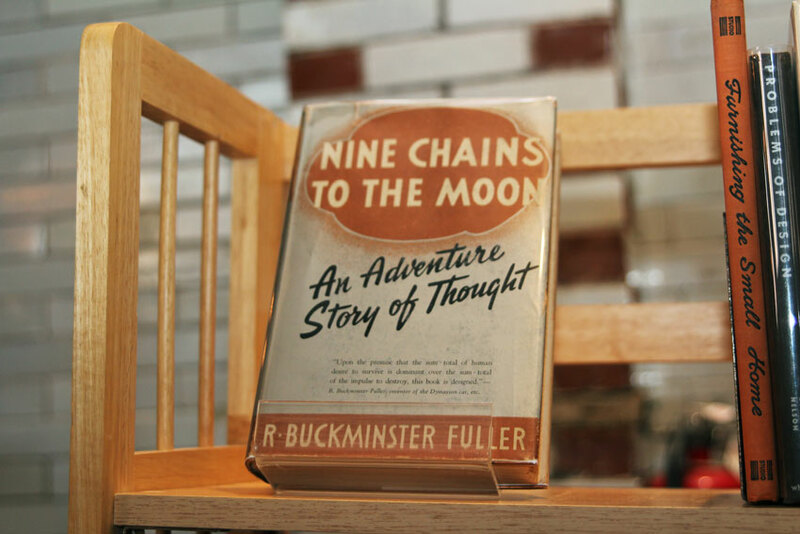 'Bucky' was many things, including author, designer and inventor. The rear cover of Verb explains he's also an "engineer, mathematician, architect, philosopher, poet, cosmogonist, choreographer, visionary..." He coined the phrase 'Spaceship Earth', invented the geodesic dome, was a president of MENSA and wrote more than 30 books. 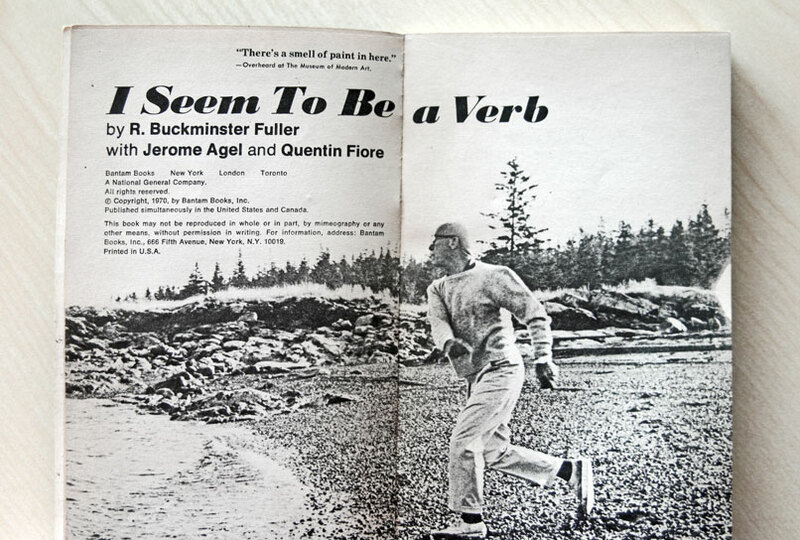 I Seem to be a Verb was written along with Jerome Angel and Quentin Fiore. 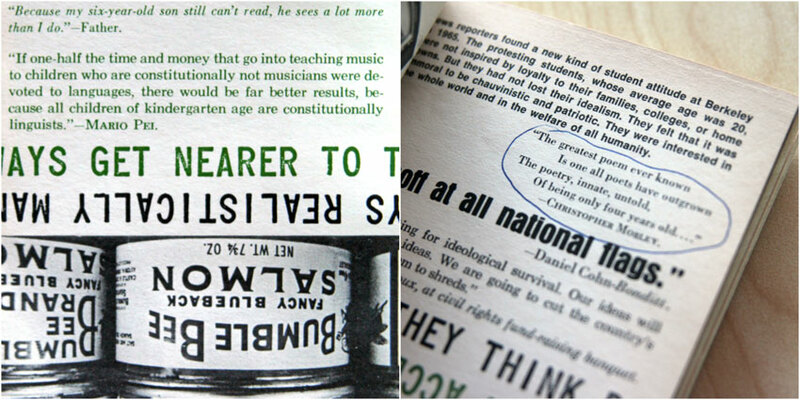 The duo also collaborated with Marshall McLuhan on The Medium is the Massage - another example of an experimental publishing from the 1960s. I Seem to be a Verb, a 192-page paperback, is post-modern. It does not have a beginning or an end. No narrative. It launches into slogans and seemingly unrelated images. The book can be read from the front to the back, or from the back to the front as 50 per cent of the text is printed upside down. Half of the content is black and white, and the rest is green and white. Copies are scarce because it's a highly sought-after out-of-print book. They usually sell for anywhere from $25 to $125 per copy, and AbeBooks rarely has more than a dozen on the site for sale. I Seem to be a Verb opens to an eye-catching title page. "I live on Earth at the present, and I don't know what I am. I know that I am not a category. I am not a thing - a noun. I seem to be a verb, an evolutionary process - an integral function of the universe." "The most important fact about Spaceship Earth: An instruction book didn't come with it." "We are waking from the American Dream to realize it was a dream few Americans lived in their waking hours." "Zambia's Board of Space Administration reportedly trains its 12-man, one-woman astronaut team by rolling it downhill in 40-gallon oil drums." "The Government is spending $450,000,000 a year on public relations alone - to tell us how well off we are." "It must be sad to be an Elizabeth Taylor, who hasn't been to a supermarket for 10 years." Meaningful quotes and images reminiscent of Andy Warhol fill the pages. Nixon and Vietnam War are reoccurring themes throughout the book. Frank Zappa is quoted a couple of times. Arthur C Clarke receives a couple of shout-outs. Police and protests also appear along with puzzling quotes about a changing world under the influence of advertising and a handful of people. It's been argued that I Seem to be a Verb is a design book. Not to me, this is a book of pop culture. Fuller would have loved the Internet (he died in 1983) with its speed, accessibility and barrage of imagery and words. Fuller's overview of technological history. He proposes a vision of future prosperity driven by ephemeralization, Fuller's term for the process of doing more with less. First published by the Fuller Research Foundation. The essays include Earthians' Critical Moment, Revolution in Wombland, Vertical is to Live Horizontal is to Die, and Ten Proposals for Improving the World. The Dymaxion map, or Fuller map, is a projection of the world on to an icosahedron, and flattened to two dimensions. Fuller claimed it gave a better representation of the world as there is no compass points, and it can be unfolded in a number of ways. Fuller urges a change in education as the information technology revolution approaches. Forward-thinking from the year when John Glenn became the first American to orbit the Earth. A collections of essays and prose-filled poems such as 'Love' and 'Intuition'. Earth is a spaceship flying through space. The spaceship has a finite amount of resources and cannot be resupplied. What should we do? A blueprint for the future composed of essays derived from his lectures in the 1960s. Fuller's thesis is that humanity - for the first time in its history â€“ has the opportunity to create a world where the needs of 100% of humanity are met. A self-portrait of Fuller's experiences that inspired his groundbreaking ideas and inventions. The essays deliver a powerful manifesto for the comprehensive design revolution he championed. Very rare. Shows many Buckminster drawings originally exhibited in a 1982 showing at the University City Science Center including the geodesic dome and the Dymaxion car, which he designed in the 1930s - it was designed for fuel efficiency and to be lightweight, revolutionary for that era. Fuller returns to humanity's situation as it faces the limits of the planet's natural resources and various political, economic, environmental, and ethical crises. Fuller conceived this story when telling his daughter Allegra her favorite story - Goldilocks and the Three Bears - every night. Each time, he would alter the story and increasingly included material from his scientific seminars. In this way, he tries to explain the universe. In Fuller's last published work, a sequel to Critical Path, he examines the rise of the multinational corporations, how they have grown beyond the control of political units, and how they threaten to bring about global depression. 'Grunch' stands for 'Gross Universal Cash Heist. What other forgotten books should be read today?